I did a property reading last week and saw something I hadn’t seen before while energetically scanning the property lines. It looked like a large glowing star and when I asked my guides what I was seeing, they explained that it was a vortex. 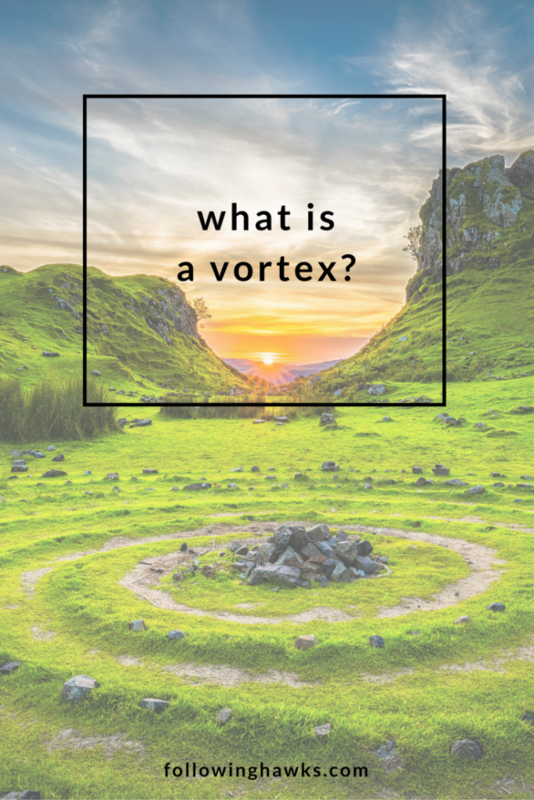 So, what is a vortex? In the reading, I asked if there was anything the homeowner needed to be aware of or do as a result of having this vortex on their property and was told that it was really no big deal. The vortex was functioning just fine and was allowing the energy to flow as it should. After a few days, I was still thinking about the vortex and how little I know about them. Many of us have probably visited some kind of tourist attraction with a mysterious house built on top of it where the laws of physics seem to change when you step inside. In fact, there’s one right here in my town and I’ve visited it on a few occasions. I decided to journey to ask my guides what I need to know about vortexes. My dragon guide stepped forward immediately and was insistent that this information was very important. She said that vortexes are located all around the globe, where energy lines in the earth cross. She showed me the earth with a giant bubble surrounding it and the energy from each vortex extended from within the earth, up to this energetic barrier. They are part of the earth’s energy grid. One purpose of a vortex is to provide transport between dimensions – we can travel energetically, like we do in astral travel. Our body remains here, but a portion of our energy (spirit?) can travel through the vortex. The dragon showed me that she is actually in the 4th dimension, and I had traveled there to have this conversation with her. She wanted me to understand that there is inter-dimensional travel happening all the time. Side note: Is this why we can’t find a Bigfoot? Because they’re moving back and forth between dimensions? I totally should have thought to ask that question! So I asked more about how we should “behave” around a vortex, especially if there is one on your property. She made it clear that you don’t want to intentionally cover a vortex with anything. The swirling energy makes trees grow crooked and can cause the ground to shift or slightly sink. But you would need a very complex crystal grid to attempt to counteract that energy (and I am not a crystal grid expert). The house may also feel very BUSY energetically. I saw it a bit like the “waiting room” in Beetlejuice (and no, I’m definitely not going to say his name three times). It also occurred to me that I didn’t understand the difference between a vortex and a portal and it was explained that if a portal is a door, then a vortex is the highway and ultimately, we would use them for the same purpose to journey and communicate with our unseen helpers just like I was doing. We don’t need to physically be at a vortex in order to use them to travel – we can do it energetically, although I’m sure proximity helps. Isn’t that the allure of places like Sedona? In the meanwhile, the energy flowing through a vortex is helping to tune the earth’s energy frequency. Strangely, my energy was extremely sapped as soon as I started the journey and I struggled to get through it awake, which is very unusual. When I finished the journey, I immediately laid down for a nap and was very groggy afterwards. I’m not sure if this is related to the information at all, but I did find it very odd. So, what has your experience been with vortexes? Leave me a comment and let me know! What is Shamanism and How Do I Journey? I recently went on a tour to Sedona to the church and before I got to the door the energy hit me when I walked through the door it was so intense almost suffocating feeling I had to walk over and sit for a bit then the energy started feeling swirly in my chest and stomach we only had 15 minutes there but wished I had more time . Hi Beth – Yes! That’s how I’ve felt at the large vortex near my house. I haven’t been to Sedona but would imagine the strength of the energy is intense! Ugh I love synchronicities in the world! Right now it was finding your article! I can definitely thank my guides for leading me here. I was JUST thinking about all the earth’s hubs for growth and innovations and how they are definitely on energy vortexes. The most interesting things I find about those places is that they are places of great duality. They have much light but also much darkness. Thank you for writing this article and showing me that this phenomenon is very real. I experienced a huge negative (counter clock-wise) vortex in the BVI’s. As soon as I stepped into the vortex I felt dizzy. As I walked toward the centre I felt like I was high. Huge piles of garbage were pulled in to the centre of the vortex and as we walked through and past the centre the pull reduced itself until I reached the far edge. I could tell immediately when I was no longer in the vortex. I had no idea what had happened but nociticed it enough to pay closer attention when I had to walk back through to return to where we had started. I have walked through several smaller vortexes in my time but nothing like that before or since. Powerful energy. Great article…energy work can be very tiring to your physical body. The healing/exchange taking place is very deep for you. Listen to your body when rest is required. Don’t fight it. Awe, for fux sake!! Did I build my home on a vortex!!!??? I like to think not! But I feel so much magic here! How do I find out???? ??? Hi Laina – Is there something happening inside your house that leads you to believe your home is on top of one? Typically you’ll be able to feel the swirling energy – stand still where you think it might be, close your eyes and see if you can feel energy moving in one direction or another. You can also tune into it during meditation and see if there is a guide that is responsible for it and ask if it’s functioning properly or if there’s anything that needs to be done.